You will be given a reference e-book to read which has 407 pages And the test will be based on that e-book , you can take final test within 1 year of purchase. What is International Financial Reporting Standards (IFRS)? International Financial Reporting Standards (IFRS) refer to the standards, framework and interpretations that are based on accounting and financial principles that are now followed and implemented by a prominent accounting body known as International Accounting Standards Board or IASB. The majority of the standards that form the IFRS are also called International Accounting Standards (IAS). The IAS is the older version of the IFRS issued by the IASC or the International Accounting Standards Committee between the years 1973 and 2011. It was last April, 2001 when the IASB started to take over the responsibility of establishing international standards for accounting. If you want to become an expert in the field of accounting, then you have to gain enough knowledge about the IFRS as these standards are extremely important when attempting to successfully execute all your tasks and responsibilities. You may decide to take up an IFRS course to further enhance your knowledge about the standards. The development of International Financial Reporting Standards (IFRS) is actually designed to help finance and accounting professionals in receiving a single set of financial standards that are guaranteed to be of the highest quality, enforceable, understandable and acceptable globally. You can expect all organizations to adopt or converge with the IFRS in order for them to enjoy smooth and properly accounted and reported financial and accounting transactions. An International Financial Reporting Standards certification will definitely inform you about the different legal standards that you need to follow when doing accounting transactions. The IFRS also aims to help accounting professionals understand the usefulness of financial statements containing accurate information in decision-making. Knowledge about the IFRS is extremely important for aspiring professionals in the accounting industry so it is just right for you if you take part in the International Financial Reporting Standards certification program offered by Brainmeasures. 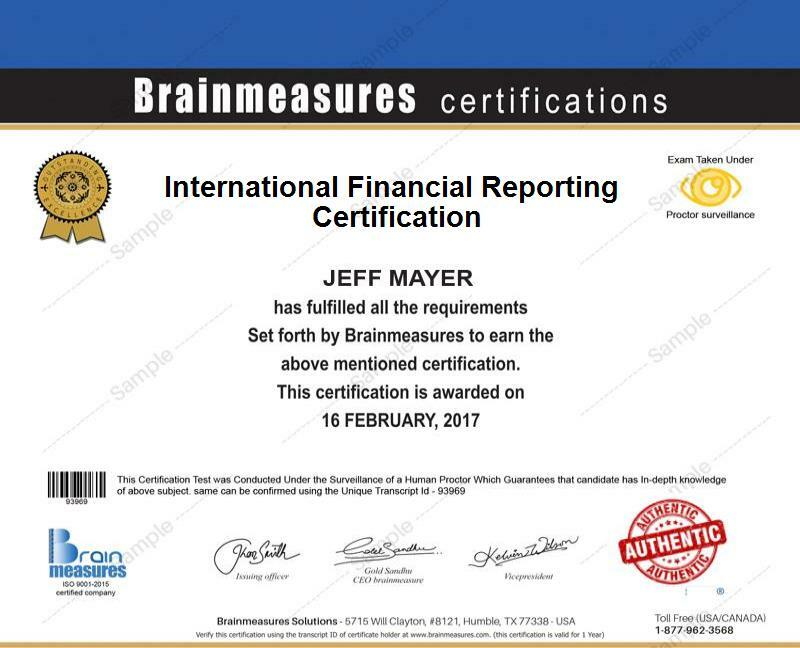 Brainmeasures is capable of providing you the most comprehensive online certification training related to IFRS considering the fact that the company has experts and professionals who work hard in developing the best programs. The International Financial Reporting Standards certification program from Brainmeasures aims to provide you with relevant information about the concepts, theories and principles behind finance and accounting. The Brainmeasures IFRS certification program will never be complete without the online accounting test which is also created with the help of accounting professionals and experts. You have to be committed in learning everything about IFRS so you will never have a difficult time passing the online IFRS exam and getting your certificate through a passing score. An International Financial Reporting Standards certification program is extremely beneficial for both aspiring and professional accountants. The program is primarily designed to help accountants, auditors, financial managers and any other financial and accounting professionals including investment advisers and bankers who wish to improve their understanding and knowledge about the IFRS. This program can also benefit financial controllers, finance directors, members of a financial team or department, analysts, lawyers, actuaries and merchant bankers. Every business organization needs an accounting expert to record, account and report all its transactions so there is a great chance that you will be earning big as soon as you complete an International Financial Reporting Standards certification course. As an expert in IFRS, you can expect your average annual salary to be $127,000.